The Page 99 Test: Sheri Berman's "Democracy and Dictatorship in Europe"
Sheri Berman's "Democracy and Dictatorship in Europe"
Sheri Berman is Professor of Political Science at Barnard College, Columbia University. She has written extensively on democracy, authoritarianism, populism, fascism, the history of the left, and European politics for both scholarly and non-scholarly publications. Page 99 in Democracy and Dictatorship in Europe in right in the middle of a chapter on the 1848 “wave”: during the “springtime of the peoples”—as this year was called—citizens across Europe rose up against dictatorships. This wave was initially at least remarkably successful, toppling what seem to be even the sturdiest dictatorships in places like Prussia and the Austrian Empire. Yet within a year or so, all the liberalizing and democratizing experiments had been crushed, and dictatorships were back on place. Why did this wave succeed and then fail so spectacularly? This is the type of question Democracy and Dictatorship seeks to answer. At the end of the twentieth century, many believed the story of European political development had come to an end. Modern democracy began in Europe, but for hundreds of years it competed with various forms of dictatorship. Now, though, the entire continent was in the democratic camp for the first time in history. But within a decade, this story had already begun to unravel. Some of the continent's newer democracies slid back towards dictatorship, while citizens in many of its older democracies began questioning democracy's functioning and even its legitimacy. And of course it is not merely in Europe where democracy is under siege. Across the globe the immense optimism accompanying the post-Cold War democratic wave has been replaced by pessimism. Many new democracies in Latin America, Africa, and Asia began "backsliding," while the Arab Spring quickly turned into the Arab winter. The victory of Donald Trump led many to wonder if it represented a threat to the future of liberal democracy in the United States. Indeed, it is increasingly common today for leaders, intellectuals, commentators and others to claim that rather than democracy, some form dictatorship or illiberal democracy is the wave of the future. Democracy and Dictatorship in Europe traces the long history of democracy in its cradle, Europe. It shows that in fact, just about every democratic wave in Europe initially failed, either collapsing in upon itself or succumbing to the forces of reaction. Yet even when democratic waves failed, there were always some achievements that lasted. Even the most virulently reactionary regimes could not suppress every element of democratic progress. Democracy and Dictatorship in Europe takes readers through two centuries of turmoil: revolution, fascism, civil war, and—finally--the emergence of liberal democratic Europe in the postwar era. A magisterial retelling of modern European political history, Democracy and Dictatorship in Europe not only explains how democracy actually develops, but how we should interpret the current wave of illiberalism sweeping Europe and the rest of the world. 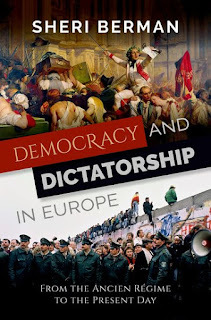 Learn more about Democracy and Dictatorship in Europe at the Oxford University Press website.